formulating further research objectives. The excitement generated by our selection as an LTER site and the subsequent initiation of our hurricane experiment has continued in our research group. 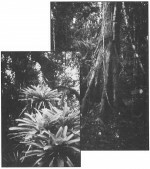 The Luquillo Experimental Forest is subject to hurricanes, landslides, non-hurricane related treefalls, and human disturbance. A goal of the LUQ LTER has been to describe the frequency, intensity, spatial distribution, areal extent, and immediate and long-term effects of these disturbances. We believe that the forest is a mosaic of patches recovering from overlapping and varied effects of different disturbances. The impact of any disturbance is conditioned by geomorphology and by stand age, structure, and composition. We have made good progress in quantifying the parameters of these disturbances and understanding how they interact with each other to produce the landscape mosaic, as well as the structure and function of particular patches. Since 1989, Hurricane Hugo has dominated research and thinking concerning disturbance in the LUQ LTER. Many results of studies on the impact of Hugo and the short-term features of recovery were reported in a special issue of Biotropica published at the end of 1991 and edited by LTER researchers Lars Walker, Jean Lodge, Nick Brokaw, and Bob Waide. This volume includes studies from the Caribbean, Mexico, and the North Inlet LTER site in South Carolina, enabling us to put hurricane damage at our site into a larger perspective. Cooperative studies with David Foster and Emory Boose at the Harvard Forest LTER are modeling landscape- level effects of hurricanes and reconstructing hurricane disturbance history for both Puerto Rico and New England. Whendee Silver (Yale) recently compared above- and below ground nutrient pools following the creation of experimental gaps and Hurricane Hugo. The creation of experimental gaps did not lead to an immediate loss of soil nutrients. A geographically-based ecosystem model that simulates basic forest dynamics as a function of meteorological inputs and hydrological simulations was also developed for LUQ LTER by Fred Scatena, Charles Hall, and Win Everham. The model design uses a readily accessible spatial and temporal computing structure, called GEOPLOT, into which additional modules can be placed. Presently the model incorporates meteorologic and hydrologic models with a biotic response model. Much of the hydrologic model was derived from a USDA Soil Conservation Service model called Simulator for Water Resources in Rural Basins (SWRRB). The present GEOPLOT version differs from the original SWRRB model in that it is spatially distributed with each computational cell responding to varying meteorological inputs, soil properties, slope and vegetation. The PROSPER evapotranspiration model has also been calibrated to the LTER experimental watersheds. Both hydrologic models will be tested rigorously in the coming year. Grid-based population studies carried out at El Verde and Bisley by Mike Willig, Larry Woolbright, Doug Reagan, Jess Zimmerman, Bob Waide, and Win Everham have demonstrated that anthropogeiiic and natural disturbances are both important in determining distribution. The principal factor structuring tree populations in a 16-ha grid at El Verde was previous land use, with topography also playing an important role. The distribution of hurricane damage over the grid was determined by a combination of species composition and topography. Variation in density of snails, insects, and frogs over the grid was significantly related to various habitat parameters. Tim Schowalter (Andrews LTER) found that canopy insect biomass distribution, herbivory, and response to disturbance at El Verde was comparable to data from a temperate coniferous rain forest in western Oregon and a temperate deciduous forest in North Carolina. Total mass intensities at El Verde are about an order of magnitude higher, indicating higher levels of productivity. Only Lepidoptera and ants showed a significant response to disturbance. Roman Dial (Stanford) demonstrated that the downwind edge of forest gaps had higher numbers of flying insects and insectivorous lizards. Lizard exclusion experiments showed that canopy-dwelling anoles are limited by non-locally recruited flying insects, and that lizards in turn limit large, non-cryptic, leaf-dwelling arthropods. This latter effect resulted in increased defoliation when lizards were removed. Investigation of two lizard species overlapping in habitat requirements found crown-by-crown competitive exclusion in areas where trees had been isolated by disturbance. Several new scientists have recently become members of the Terrestrial Ecology Division staff. Jess Zimmerman (Utah) is directing activities at the El Verde Field Station and investigating plant phenology and the population dynamics of understory shrubs. Randall Myster (Rutgers) is conducting a series of experiments on the effect of seed rain, seed predation, and differential initial conditions on subsequent regeneration on landslides. Xiaoming Zou (Colorado State) has begun a study of the control of phosphorus dynamics in forest soils. Doug Schaefer (Dartmouth) is initiating a study of atmospheric deposition across elevation, exposure, and disturbance gradients. Mike Keller (formerly of NCAR) has joined the staff at the Institute of Tropical Forestry to conduct studies of the effects of land use change and disturbance on atmospheric chemistry. Robert Walker (formerly of Florida State) will focus on economic assessments of resource use in the tropics for ITF. Whendee Silver (Yale) has taken a post-doctoral position at ITF and will continue her studies on the effect of disturbance on nutrient cycling. Mitch Aide (Utah) has joined the Biology Department at the University of Puerto Rico-Rio Piedras and will initiate studies of herbivory shortly. Alberto Sabat (SIJNY-Albany) has also joined the department and will continue his studies of the demography and reproductive behavior of the Sierra Palm. Construction of a new dining hall and remodeling of kitchen and bathroom facilities were slated for completion at the El Verde Field Station in October. This work was made possible by the NSF and will alleviate overcrowding at the station. P.O. Box 363682, San Juan, PR 00936-3682, 809-767-0334, or Ariel Lugo, Institute of Tropical Forestry, Call Box 25000, Rio Piedras, PR 00928-2500, 809-766-5335.